I read Roxane Gay’s Bad Feminist a few months ago and immediately put her next book, Hunger: A Memoir of (My) Body on my library request list. I described the former as unpacking the racist, misogynistic, and otherwise flawed world we live in. This book is that, but turned inward. Gay reckons with the great violence which was a turning point in her life and how it created in her a need to protect herself by becoming ever larger. She also discusses candidly what it is to be aware of the judgments of your body while simultaneously giving into the various hungers you feel. Bad Feminist was complex, empathetic, and rational and if it is possible this book is even more so. It is difficult to know how to review this book. In ways it was too much: Gay is practicing an emotional honesty in her writing that you do not often come across and it often stopped me dead. In other ways I felt too seen, I recognized the emotions and realities of Gay’s life experience in my own even though so much is different. 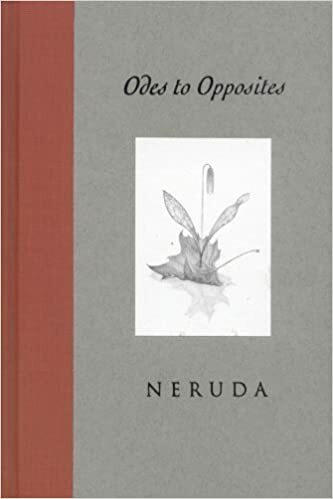 She writes with such precision and clarity that the shared territory becomes what matters and you are able to immediately extrapolate the rest and find the empathy within. Reading this book, with its short, crisp chapters, is like watching someone you care deeply for exorcise their demons, and if they cannot exorcise them they will name them and continue the fight. It is witnessing someone’s journey towards healing but more importantly just talking about the things that seemed too large to talk about. We heal by talking about our hurts, our hungers. This is Roxane Gay embarking on that path. This book was read and reviewed as part of the charitable Cannonball Read where we read what we want, review it how we see fit (with a few guidelines), and raise money for the American Cancer Society in the name of a fallen friend. We have reached the end of the road. We have journeyed through truth, learned about the past, had boulders change our paths forever, embraced the drama of the teenage years, we’ve experienced losses and found ways to grow from them, and seen love as an action spurs our heroes on their paths. Now, we watch it all come together as the forces of good battle to resist the forces of fear and hate. Not every book, or every series, is for every reader. There is no guarantee that someone would pull exactly the same meaning, or so much meaning, from the works of J. K. Rowling, as I tend to do. Here at the end it is time to look back at the themes and narratives that have brought me here and see how they all come together to leave us on a note of sorrow and loss, but also hope and triumph. In the beginning, we found Harry Potter as a boy who did not have much to define himself, but by book seven he is a man who knows very well who and what he is, but is still learning his value to others. Voldemort, the Death Eaters, and their allies are making swift gains particularly at the Ministry (as that organization refused to prepare itself for the truth of their ascendance), and it is time for Harry to leave Privet Drive for the last time. This is no easy task and requires backroom planning by Dumbledore, for Snape to continue working both sides against each other, and six Harry Potter impersonators to disguise his true location and destination. Harry has transformed from the Boy Who Lived to the Chosen One, and by the end of the book he will bring everything together to be a hero who inspires other heroes. He never truly vanquishes the small voice in his head questioning if he’s made the right decisions along the way. He knows what he must do, and the path he has chosen, but he is always reticent to let others step in the way of danger that he has laid out. But moving beyond the specific details of Harry’s character arc, this is a novel about generational divides, a statement that the old must pass that the new might inherit the earth, because whatever current generation is on top can’t save the world. All things change and evolve. The world can only be saved and shaped by those who will inherit it. The last image is of the next generation who will take over once Harry and his friends are done and dusted. The second act of this book, the much maligned second act of this book, is the story of one of the strongest friendships you are likely to see in contemporary YA literature. I could write soliloquys on the Ballad of Harry, Ron, and Hermione, in fact I may be accused of already doing so. In this book, if not before, they are functioning as a tight-knit family unit. But, we are also once again reminded of the deep, strong ties Harry has developed over the preceding six years. It is unthinkable that he wouldn’t be at Bill and Fleur’s wedding, it is their home that he and the rest escape to and recover in following the events at Malfoy Manor. Separate from his feelings about Ginny, Harry is a Weasley and in case it was still up for debate Rowling makes it clear at the very beginning of the book. I love Molly Weasley. She has always, quietly, diligently, and without expectation made Harry part of her family. In Order of the Phoenix as the boggart in Grimmauld Place Harry’s is one of the bodies she sees in the lineup of her dead family. For his seventeenth birthday Molly gifts Harry her brother’s watch, and it will connect Harry to his found family throughout the events of the novel. But Harry isn’t Molly’s only extra kid. At the end of the Battle of Hogwarts as all hell is breaking loose in the Great Hall, Molly bests Bellatrix Lestrange in one of the most discussed moments in the book. Much is made of Molly’s pronouncement of “not my daughter!” as she flies across the room to take on Bellatrix, but it could just as easily been “not my daughters” as the trio of witches taking on Bellatrix are Hermione, Luna, and Ginny. And it is Harry who throws up the shield charm to protect Molly, exposing himself to Voldemort and setting up the final battle, but he could not let his surrogate mother figure go unprotected. For all of our characters this story is how they struggle to defeat a fully empowered adult wizard by becoming fully empowered and independent adults. Neville Longbottom has grown by leaps and bounds throughout these seven books. While his confidence and skill have grown, the true measure of his character has been with him from the very beginning – you must stand up for what is right. He calls out his friends in Sorcerer’s Stone and by Deathly Hallows he is leading the resistance in Hogwarts and paying a heavy price for it (but he’s just living up to his Longbottom heritage). Ginny will not be left to the side. She was instrumental in the eventual discovery of the first horcrux in The Chamber of Secrets (before we even knew what it was), and she marches through the subsequent five books demonstrating her skills and tenacity. She will fight for those she loves, and she will be brave enough to face down her enemies. There is another character who quietly continues to work on the side of Dumbledore. At then end of Half-Blood Prince the reader is left hating Snape, and there is little through most of Deathly Hallows to bring us back in. There is however the flashback in the pensieve showing us the true intentions of Snape’s actions over the past 20 years. I remain on the side that it does not erase his actions, but it places them in an understandable lane. It is the final example of Rowling showing us the gray that lives within all of us. I am light on speaking about Hermione in this review, not because she isn’t incredibly valuable, its just because I’ve covered it all before. Hermione does not need me to stand up for her the same way she doesn’t need Ron or Harry to. There is a scene, late in the book during the Battle of Hogwarts when Harry, Ron, and Hermione are attempting to fight off imminent Dementors. They are trying and failing to cast their patronuses to defeat them, to protect themselves with happy memories filled with love. They are spent, and things are looking down until friends cast bright powerful patronuses to push back the dementors. As the line of people who have supported Harry grows and powerfully push back the coming darkness through the power of love and happy memories I cried. It is everything to do with standing up against the coming storm, and standing up for those you love and respect. Ron also becomes the full embodiment of his family’s ethos, a beacon of progress and humanity. Ron continues to be concerned about those he cares about, it is Ron who thinks of the House Elves in the kitchens of Hogwarts and reminds everyone that they need to be evacuated with the underage students. With that, Ron shakes off one of his largest prejudices completely, taking away any part of him that could be used to support Voldemort. It is also the linchpin that earns him an enthusiastic kiss from Hermione. I may have cheered. Ron has skills, memory, and ability. He is the one who remembers to go get the basilisk fang from the Chamber of Secrets. But that doesn’t mean he is without failure. Ron, in his typical way, loses sight of the end goal and leaves Hermione and Harry alone in the forest. Nevertheless, the joy of Ron is that once he makes the terrible, prattish decision, he immediately regrets it. The measure of character is in recovery from terrible choices and how we pick ourselves back up, and Ron spends seven books showing us how that is done. Dumbledore knew this about him, and provided a way back. Rowling also uses this time to her advantage, giving the reader a glimpse at the world outside the ever-traveling tent. We are afforded a look at what the larger Resistance movement is doing while our trio is working towards their assassination mission. The entire journey of Harry, Ron, and Hermione is The Deathly Hallows can be seen as one long arc of pursuing knowledge, and asking for help, in order to successfully solve the problems of our lives. In their case, it is often about defeating Death Eaters, but it is also in learning how to navigate the adult world which is not nearly as steady and secure as one would hope. If the world is full of darkness, than knowledge is your best armor and strongest light against it. Hermione will carry a full library with them, Harry will craft cunning plots, Ron will stay on the alert and find the resistance radio show, and together they will ask for and accept help as they can. It is never so clear as when Harry shouts into the shard of Sirius’s mirror and unbeknownst to him Aberforth hears him and sends Dobby to rescue them from Malfoy Manor. Harry has finally come to a place where he cannot save himself or his friends, and he reaches out desperately. Dobby is able to evacuate those imprisoned in the cellar (all important characters for the final denouement of the story) and ultimately puts his life on the line for his friends. The grief, pure and simple and stunningly apparent on Harry as he digs the grave for Dobby (who died a free elf) stirs something deep inside the reader. Harry feels he must do the work himself, so magic, so that proper respect can be shown. Dobby’s sacrifice requires no less of a man of Harry’s stature. Neville and Dumbledore’s Army are another shining example of this spirit. Neville stays at Hogwarts, and continues the resistance from inside the walls, making himself a constant thorn in the side of Snape and the Death Eaters on staff. He also protects and cares for those who would stand beside him, and by having truly learned the lessons of the Room of Requirement he is able to furnish all the needs of his compatriots, including access to Hogsmeade via Aberforth. And Aberforth Dumbledore is a quiet, reluctant hero himself. He feeds and cares for the Army, as well as serving as transit depot for members of the Order of the Phoenix and the Resistance. He also provides on last important reality check for Harry, Ron, and Hermione before the Battle of Hogwarts truly gets underway: does Harry trust in what he has been told by his brother Albus? Aberforth argues that Harry owes no one anything, and should run. He also points out, not incorrectly, that while our Professor Dumbledore did mostly prepare Harry for what is coming, he also in essence raised him like a lamb for slaughter. Aberforth cannot abide this, and attempts to use the full truth off Albus, and Grindelwald, and his sister Ariana to make sure Harry understands what is truly happening. He is never satisfied, but he finally does support Harry and sends Ariana’s portrait to go get Neville. What I did not know, but I could feel creeping in, was that part of the pull of reading Harry Potter again was that my brain chemistry was betraying me once more. My previous worst battle with depression came during the first time I read The Prisoner of Azkaban and this current round has been nearly as difficult. Add to that finally getting some clarity about the Anxiety I’ve been living with my entire adult life, and it’s been a hell of a year. However, I think this finally explains to me my preference for and love of Remus Lupin. I am on record as praising Lupin as the best Defense Against the Dark Arts teacher to grace Hogwarts during the series, and I stand by it. He educates kindly. It is such a small, but unfortunately rare thing, and I think it gets missed in the larger sweeping epic of the books. But this is not a perfect man, in many ways Lupin grew up too fast and never properly left his teenage self behind. Lupin, like so many of our other characters, is learning to embrace his adulthood and for him it is in the face of crippling depression, anxiety, and otherness. It comes to a head in the Deathly Hallows as Lupin attempts to join our trio as they depart Grimmauld Place to begin their quest. Lupin is afraid that he has ruined the lives of Tonks and their unborn child, and is ready to flee and possibly sacrifice himself in the service of Harry and his mission in place of facing the future he has made. He is still unable to accept the love his is offered. Harry ages dramatically in that scene, moving past his defiant youth posturing and bringing his emotional truth to bear in a stunningly adult exchange with Lupin. Hermione and Ron are shocked, this is an adult, their teacher, and Harry is speaking to him in such a manner. But it is necessary, and it is true. Remus Lupin, like all of us, must grow into the truth of him, and forgive himself for his past errors. He must also learn that refusing love is the worst thing we can do to ourselves, let alone those who love us. Lupin comes around, and is back to his truest self when he arrives to fight at the Battle of Hogwarts. His and Tonks’ deaths are some of the hardest felt in the series (Fred is right there with them), and they are so because of what we have lived with them over six books. These are good, loyal, and moral characters who made the active choice to fight for good and put their lives on the line in the pursuit of defeating evil in the world. This one is more for the author than her characters, but it is superb nonetheless. In her final book Rowling, because she is truly an insanely ambitious, amazing writer throws out all previous conceptions of the structure of a Harry Potter novel. She had played with form and structure along the way, but in her closing act she isn’t afraid to do something she has not done before; this is simply the act of a woman in full possession of her courage. The first act, from page one, shifts the paradigm in a way that couldn’t truly be anticipated and still catches me off guard now a decade later. The entire middle of the book is essentially a two and three handed road trip, taking us to places we have never seen before through the eyes of our characters. It also dares to slow down the action, to marinate in the struggle, to let the reader and the characters feel a smidge of boredom. For goodness sakes, Hogwarts doesn’t show up until the third act! AND THEN Rowling introduces a completely new branch of the mythology around which the whole climax of the novel pivots. 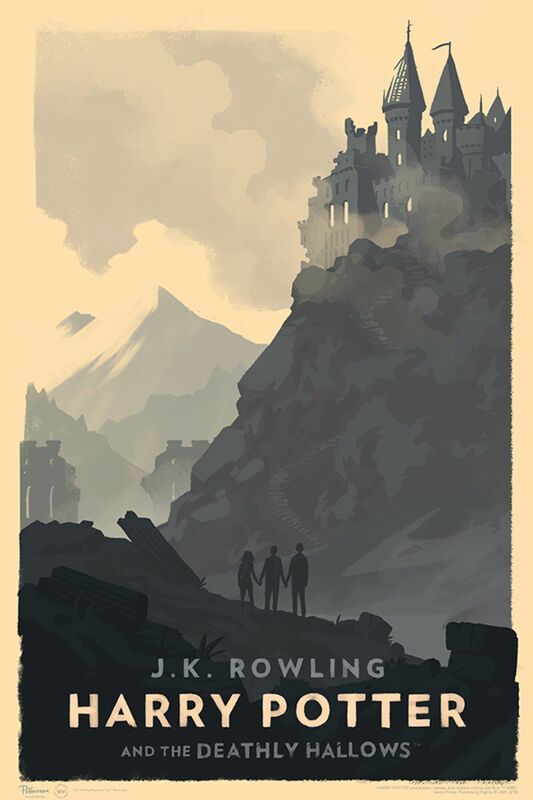 It would be easy to forget that Rowling saved the mythology of the Three Brothers for this final installment because it fits so seamlessly into the world she painstakingly and brilliantly created. It is the sort of thing that probably shouldn’t work. We should be annoyed at the last minute deus ex Hallows but instead we see the threads that Rowling has been laying in all along, and frankly, she pulls it off with finesse and grace because while the final piece of the puzzle is delivered in the tail end of the series Rowling has been deliberately building to this point from the beginning, and double downed towards it based on the themes at play in Goblet of Fire and Order of the Phoenix. But that’s still not all: she too shows a deft hand in a chapter that’s a taut thriller in Malfoy Manor. It is a peak into the prowess she has to create tension and suspense which will come to delightful fruition in the Cormoran Strike series a few years later. And where does that leave us at the end? It leaves us with a final rumination on choice and love. Every single person chooses their sides and their actions throughout the story. Everything reverberates down the line. The story is simultaneously massive and epic and yet impossibly small and understated. There are colossal moments flying past that mean more because they are rooted in the personal. We are watching the myth of the boy who lived, who inspired a nation, who became the rallying point make the choice to act in love for his friends and compatriots, for those he considers family, so that they may live. Following all of that, he makes the choice to live. He chooses life, and he chooses to imagine a future that he is in. We should all do the same. This completes my reread of the Harry Potter series in the 20th anniversary year of the publication of The Sorcerer’s Stone. It has meant a great deal to me. This book (and accompanying series) was read and reviewed (at length) as part of the charitable Cannonball Read where we read what we want, review it how we see fit (within a few guidelines), and raise money in the name of a fallen friend for the American Cancer Society. Registration for our 10th year will be coming up soon, and you can always drop in whenever you like. I try to give myself a healthy reading diet, and part of that diet is books from the point of view of people who do not experience the world the same way my privilege as a cis white woman allows. When I picked up March: Book One it felt in many ways a basic history, an introduction to world that I was already relatively familiar with, even though it was not my own. If Book One is a primer then Book Two is a call to arms which leads to Book Three a rallying cry to continue the work of The Movement. In these astonishing works John Lewis and his collaborators make accessible for all who care to listen what was truly on the line with the movement for Civil Rights in the first half of the 1960s. It may be tempting to think of “the Civil Rights Movement” as a single time in a single place, but what Congressman Lewis is teaching us here is that the truly nonviolent movement, which is the only way for a successful movement to his mind, came from many quarters and took place over years (and decades), and was and is the responsibility of all of us. I was knocked flat by the powerful souls who put their very lives on the line for what they believed, what they knew to be true. In working with his co-writer (and staffer) Andrew Aydin, and trusting those words with “a great artist …who can make the words sing” in Nate Powell we are gifted with a combined work that is akin to sitting through an amazing sermon: you learn, you grow, and you feel uplifted and called to action. Book Two focuses on the years 1960-1963, specifically on the Freedom Summer and Freedom Rides campaign. 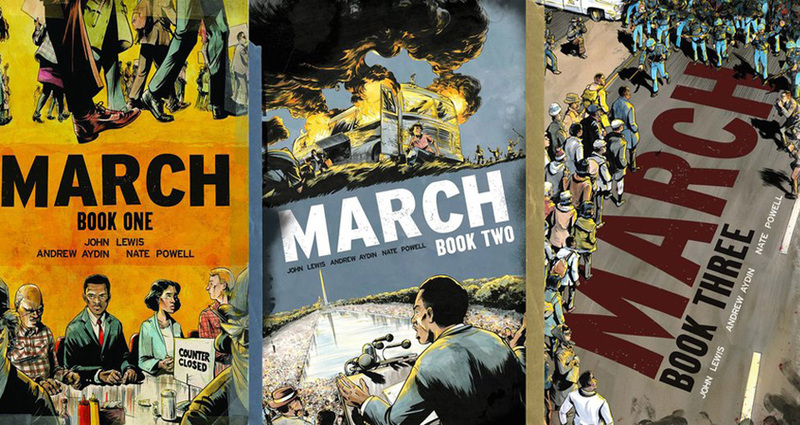 Book Three picks up in 1963, specifically the firebombing of the 16th Street Baptist Church in Birmingham, Alabama on September 15, 1963 and culminates with the Selma marches and the passage of the Voting Rights Act. There are few events that matter as much to the situation we find the United States in here in 2017 than the gutting of the Voting Rights Act in the summer of 2013. Congressman Lewis and his works remain, unfortunately, as relevant as ever. He was a leader of the #nobillnobreak sit-in on the floor of the House of Representatives last summer to get a vote on gun legislation and it is in the shadow of his nonviolent legacy with SNCC that brave men and women today continue the work of The Movement. You need look no further than Colin Kaepernick and Jesse Williams and the countless others who continue to fight for full citizenship for all Americans. It reminds me to fight harder for what I know is right, and to not let my anger push me to act in a way that would not make Representative Lewis proud. Now we need courage, we need to emulate John Lewis and believe in peaceful protest and assertiveness. There are many reasons this book won the National Book Award. Go read these, now. While I love almost all things Jane Austen, I have a slightly bumpy history with Northanger Abbey. I read it for the first time back in 2013 when I was trying to make sure I had read all of her major works, and this was my last (I still have the minor works, but I’m in no rush with those). 2013 is in some ways my dark Cannonball year. I hit a major reading slump during a depressive episode and didn’t read for months at a time. Northanger was my thirtieth book that year but I declined to review it, ending at 29 with Eleanor &Park instead. I struggled reading it then partly because of where I was emotionally, and partly because I made the grave error of reading the introduction first which gave away all the fun of the novel. BOO to Alfred Mac Adam, professor at Barnard College, Columbia University. Last year a friend lent me Marvel’s Jane Austen’s Northanger Abbey comic to try it again and I came away from that experience much more positive about the story. The important thing I took away on second go was that this is Austen being down right hilarious in her authorial voice, I was not sad to revisit it once more. Northanger was the October selection for the Go Fug Yourself book club on Goodreads. 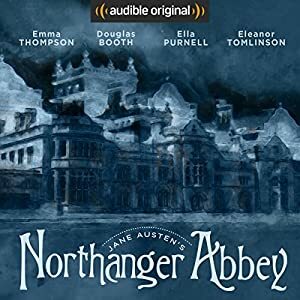 I decided to bump my audio copy of Northanger up the to read list and get to it. What I hadn’t realized was that this was yet another adaptation, in the vein of the comic I read last year. Anna Lea had taken Austen’s novel and broken it up into an audio drama which Audible cast masterfully. Seriously, it features Emma Thompson as the narrator/Austen as well as Eleanor Tomlinson, Ella Purnell, Jeremy Irvine, Douglas Booth, and Lily Cole. By further pulling the narrator’s voice outside of the goings-on of Catherine we the reader are treated to an even more biting commentary of the gothic novels promulgated in Austen’s time. Also, it doesn’t hurt to have Austen’s observations delivered in the biting tones of Emma Thompson. I am enchanted with the steadfast goodness of Eleanor Tilney, the bright eyed innocence of Catherine Morland, and the textbook baddie nature of John Thorpe. I find myself now much more positive in my appreciation of this work than I was four years ago when I encountered it for the first time.